Five years ago I posted this on the feast of St Thomas of Canterbury. He is still the patron of parochial clergy, although St Jean Vianney seems to have taken much of the limelight lately. Also a fine patron for those who need to distinguish which are the things of Cæsar and which are the things of God. Deus pro cuius Ecclesia gloriosus Pontifex Thomas gladiis impiorum occubuit: præsta, quæsumus; ut omnes, qui eius implorant auxilium, petitionis suæ salutarem consequantur effectum. Per Dominum nostrum Iesum Christum. Amen. 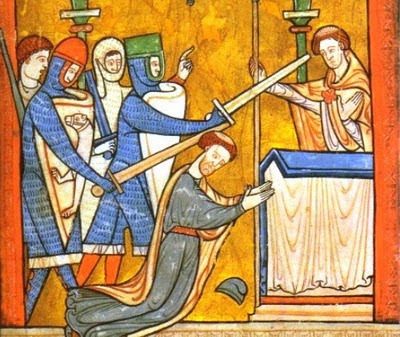 O God, for the sake of whose Church the glorious Bishop Thomas fell by the sword of ungodly men: grant, we beseech Thee, that all who implore his aid, may obtain the good fruit of their petition. Through our Lord Jesus Christ. Amen. According to the ancient Ordines Romani, two vigiliary offices were sung to-day by the papal choir, as was usual on the most solemn feasts of the yearly cycle. In the first, three psalms were recited with five lessons and as many responsories. In the fourth of these the Jews were reproved because they would not acknowledge the Messiah, now about to be born, and in the corresponding responsory were sung the famous Sibylline verses, Judicii signum, tellus sudore madescit, so that even the pagan muse might rebuke that obstinate people for their unfaithfulness to God. After None, the Pope, surrounded by the high officials of his Court, celebrated the stational Mass at St Mary Major, followed by the Supper provided by the Bishop of Albano, to which the Pontiff him­self sat down, together with the accompanying prelates. After this Vespers were sung, but as the vigils were to begin again at midnight, the Pope, instead of returning to the Lateran, arranged to spend the first part of the evening in the Liberian Palace, not, however, before he had with his own hands administered a cup of wine to each of the clergy, including the youthful singers of the Lateran schola. In quite recent times Pius IX used to go to St Mary Major on the evening of the Christmas vigil, and there begin the first Mass early, so as to be in time to return to the Quirinal before the hour should have struck at which the ecclesiastical fast commenced preparatory to the following day's Com­munion. Unlike the other vigils, in which the penitential character and a sense of sadness predominate, that of Christmas, like the rest of Advent, is full of vivacity and holy joy. This is fully in accordance with the nature of the heart of man. After so long a period of anxious and painful expectation the sudden news of our approaching deliverance lightens the heart, while a common joy unites us and makes us forget for a moment the hard conditions of our life here below. We feel that we are all brothers, the sons of one Father; we are born again with the Christ-Child to the beauteous simplicity of a holy and spiritual infancy, and are brought back again by love to the perfect happiness of un­fallen man in paradise. The Christmas preparations are finished at last and I've even some time left for attending to The Inn. The tree has never looked so good, if I do say so myself. But the manger scene is lacking. There should be a little light on the inside that illuminates it but the mechanism is kaput. Where does one get a strand of electrical wire with a plug at one end and a socket for one (1) Christmas tree light at the other? I think I could fit a little flash light up there but that would run through a battery an hour. Suggestions welcome. We'll have Christmas Eve dinner at the house of some friends. The small pipes are humming away this year and there are a few carols sounding appropriately jolly with the bass and baritone drones going with the A chanter. The D chanter isn't quite ready for prime time. Still not used to holes so close together. But I should be able to play for my supper with the A chanter. High Mass tomorrow at St Therese should put the cherry on the cake. It's so wonderful to be able to celebrate Christmas not only properly in the Roman Rite, but in such a glorious way as it's done at St Therese. Especially after 30 years in the novus ordo desert. Hodie scietis, quia veniet Dominus et salvabit nos! Et mane videbitis gloriam eius! Or ever the sun be risen, ye shall see the King of kings proceeding from the Father as a bridegroom out of his chamber. Alleluia. After an unconscionably long time, the latest number of Gilbert arrived the other day. The eponymous Gilbert is, of course, G.K. Chesterton, with whom we have been spending the evening. A man can impose education without having it himself. But a man cannot hand on tradition without having it himself. The limitations of a liberal mind are much more dangerous than those of a narrow one. When does an interest charge become usury? Something called First Premiere Bank thinks 79.9% isn't there yet. Takes the breath away. Specially for those of us convinced that Belloc had it right: pretty much always. Who Says God Doesn't Have a Sense of Humour? I heard it on the radio this afternoon. The Great Copenhagen Global Warming Confabulation is taking place as we speak. All the unco guid of the world are meeting in Copenhagen to bewail global warming. And it's snowing on them. 10 inches so far. How often does it snow in Copenhagen at Christmastime? Pretty much never. They've had 7 white Christmases in the last century. The morning papers and one blog have been refining my knowledge of English this morning. Right off the bat - so to speak - we learned in Doug Kirkorian's column in the Long Beach PT that earning $465,000 a year is a "pittance". At least it is for a baseball player, so perhaps "pittance" is relative. To Salahi: v. U.S. [after 21st century reality-show aspirants Michaele and Tareq Salahi] 1. intrans. to gain entrance to an event or gathering to which one is not invited. "They Salahied into the Bar-Mitzvah even though they didn't know the Goldblatt boy, and ate most of the chopped-liver sculpture of Elvis." Shakespeare, Sonnet MMIX. 2. in a general sense to appear where one is not welcome. "Michael Moore Salahied into George and Laura Bush's second honeymoon to lecture the former president about justice for the undocumented immigrants held at Guantanamo." Chomsky, Profiles in Courage. 3. to forge, fake or pretend, especially in hope of achieving a contemptible or pathetic objective that is simultaneously a comment upon the corruption and distastefulness of a particular individual and society itself. trans. "To elevate his chances of becoming a Chippendales dancer, Arnold Toynbee Salahied a letter of recommendation from Rosa Luxemburg. Al Franken, An Intellectual History of the United States. And Molly has dusted off a wonderful old word: stravage. It's found in Scotland, Ireland, and the north of England and means to wander aimlessly, to saunter, or to stroll. This is excellent. I do an enormous amount of that. Stravage should come in very handy. I would very much like to incorporate that into. . .well, anything. It should pop up any day now in The Inn. Unfortunately, use in conversation will have to wait until I get an authoritative ruling on pronunciation. There are two samples on the web. One says "STRAV-idge" and the other "struh-VAIG". There's always something. Noticed in Barry McCain's lively blog a few days ago. I'm not but I might be if I weren't a Carmelite. If you are, I ran across this website this afternoon: Using the Benedictine Monastic Diurnal. It's just what it says: a site to help you navigate the M.D., which has a completely different arrangement than the old Roman Breviary or the new Liturgy of the Hours. Looks quite useful. This dogma of the Catholic Faith which is so consoling for us, so glorious for Mary, and so honourable for the entire human race, is only dimly foreshadowed in Holy Scripture, whether in the Old or the New Testament. Yet it forms part of the divine deposit of Catholic tradition, and finds in the liturgies of the various churches the most authoritative witness and exponent of this same belief. who under every aspect are entirely beautiful, since in thee, O Lord, there is no stain, nor any blemish in thy Mother." Very many Fathers of the Church, especially the Greeks of the first patristic age, repeat the same thought concerning the absolute purity of the Blessed Virgin, although the greater number, rather than propound the formal question of the Conception as it was put forward later by the Scholastics, suppose it rather to be resolved in the meaning of the dogmatic definition of Pius IX~name1y, that the immaculate purity which they ascribe to the Mother of God is to be understood in its fullest signification, so as to exclude even the blemish of original sin. A local feast on December 9 in honour of the Conception of Mary most holy is mentioned in a sermon of Bishop John of Eubœa, a contemporary of St John Damascene. About a century later the festival had gained ground, and had become common among the Greeks, as appears from a discourse of Bishop George of Nicomedia on the "Conceptio sanctæ Annæ." The early Fathers in general take this word in its active sense, so that in their calendars the heading Conceptio sanctæ Mariæ commemorates instead the Incarnation of the Saviour. The feast of the " Conception of St Anne, Mother of the Mother of God," appears under December 9 in the calendar which bears the name of the Emperor Basil II Porphyrogenitus, and is likewise included among the feasts to be kept as holidays of obligation in a decree of Michael Comnenus in 1166. In the West the Conceptio sanctæ Annæ is noted on December 9 in the famous marble calendar of the Church of Naples, which dates back to the ninth century. The date and the title at once reveal Byzantine influence, an influence dominating over not only gay Parthenope, but Sicily and all Southern Italy, which for many centuries continued to form part of the Empire ruled over by the later successors of Constantine and Theodosius. In the twelfth century, we find that in Normandy, in England, and in Ireland, the feast of the Conception of the Blessed Virgin on December 8 had been received with enthusiasm in several abbeys and canonical chapters, in spite of the protests of some opposing bishops. How had this primitive Eastern festival found its way from the shores of the Bosphorus to those distant lands? It is commonly believed that the vehicle of its transmission was the Norman army which in the eleventh century invaded and established itself in Southern Italy. This, however, is not altogether certain, yet it must be admitted that the earliest English and Irish records of the feast of the Conception show distinct evidence of Greek origin. We must now consider what was the original significance of this feast of the Conception of St Anne, or of the Mother of God. In no ancient liturgical document, it is true, is the title “immaculate” added to the word “Conception,” but from what has been said above, it is clear that it must have been implicitly understood, for otherwise the feast would have had no particular meaning. This is also confirmed by the Byzantine feat of he Conception of St John the Baptist, which festival commemorated the sanctification of the Precursor of Christ in his mother's womb. The Roman Liturgy remained content for many centuries with the four great Byzantine feasts in honour of Mary, and did not celebrate her Conception. When the first controversies on the theological aspect of the solemnity began in the West, Rome, before pronouncing a decision, permitted the great champions of sacred science to bring forward their various arguments, St Anselm, the Canons of Lyons, St Bonaventure, and Duns Scotus opposing Eadmer, St Bernard, St Thomas, and the most celebrated medieval liturgists. It was of great importance in the external history of the Catholic dogma of the Immaculate Conception that the recently established Order of the Friars Minor constituted itself its apostle and defender throughout Europe. As early as 1263 the feast was kept as a day of obligation in all Franciscan monasteries, and it was certainly due to their enormous influence and popularity that in the thirty-sixth session of the schismatic Council of Basel on September 17, 1439, the assembled Fathers declared that this doctrine found full confirmation in the sources of Catholic revelation. Under Sixtus IV – a Franciscan Pope – the Roman Church took a truly decisive step. By a decree of February 27, 1477, this Pontiff ordered the observance of the feast, and the use of the Office: Conceptionis Immaculatæ Virginis Mariæ for the whole city. Two years afterwards he erected and endowed in the Vatican Basilica a chapel dedicated to the Blessed Virgin under the same title of the Immaculate Conception. The favourable attitude shown by the Council of Trent towards the dogma of the Immaculate Conception of Mary is well known; but the extreme prudence of the Holy See allowed three more centuries to elapse before coming to a final decision on the question, which for more than nine hundred years had agitated the most eminent theologians of Europe. This glory was accorded by divine Providence to the holy Pontiff Pius IX, during whose reign the prolonged studies of the Doctors of the Church regarding the sources of the Catholic doctrine of the Immaculate Conception of Mary were at last brought to an end. On December 8, 1854, before an imposing assembly of several hundred bishops, the Pope finally promulgated in St Peter's his Bull Ineffabilis Deus, in which this dogma is defined as being in conformity with the Catholic Faith as revealed by God, and therefore to be believed and held fast by all the faithful. concerning the dogma of the Immaculate Conception, obtained from them a definite declaration written and signed by three patriarchs and an archimandrite. That of the head of the Syriac Church was worded as follows: Ego Pauper Ignatiuis Andreas, Patriarcha Antiochenus nationis Syrorum, confirmo hanc sententiam orthodoxam, quam explanavit P. Ioseph e S. I. dominam nostram Virginem purissimam sanctam Mariam, semper liberam extitisse et immunem a peccato originali, ut explicuerunt antiqui Sancti Patres longe plurimi, magistri Orientalis Ecclesiæ. credendi lex statuat supplicandi, as Pope Celestine I (423-32) would have so well expressed himself. It teaches us, in the first place, that the privilege of the Immaculate Conception of Mary was ordained in the counsels of God in order to prepare an absolutely holy tabernacle for the Word of God, which was to be made flesh in her and by her. The price which Jesus paid for this privilege is then set forth; that is to say, the merits of his passion and death, foreknown by the Eternal Wisdom of God, so that Jesus Christ is and always will be the universal Saviour and Redeemer of the whole human race. Mary, the masterpiece of God, is thus the first to participate in a unique and more sublime manner than any other mortal in the grace of redemption. Lastly, we beseech the divine clemency that by the intercession of so noble and privileged a being, whom God did not permit to be touched by the slightest breath of evil, we also may be granted the grace of a pure spirit, so that we may come to him whom, as the Gospel says, only the clean of heart can deserve to behold. Deus, qui per immaculatam Virginis Conceptionem dignum Filio tuo habitaculum præparasti: quæsumus; ut, qui ex morte ejusdem Filii tui prævisa, eam ab omni labe præseverasti, nos quoque mundos ejus intercessione ad te pervenire concedas. Per eundem Dominum. Amen. O God, who by means of the Immaculate Conception of the Virgin didst prepare a worthy dwelling for thy Son, and foreseeing his death, didst thereby preserve her from all stain, grant that we too by her intercession may come to thee unstained by sin: through the same Christ our Lord. Amen. O God, Thou didst make blessed Nicholas famous by countless miracles; deliver us, we pray Thee, by his merits and prayers, from the flames of hell. Through Christ our Lord. Amen. Almighty God, who in Thy love didst give to Thy servant Nicholas of Myra a perpetual name for deeds of kindness both on land and sea: Grant, we pray Thee, that Thy Church may never cease to work for the happiness of children, the safety of sailors, the relief of the poor, and the help of those tossed by tempests of doubt or grief; through Jesus Christ our Lord, Who liveth and reigneth with Thee and the Holy Ghost, one God, for ever and ever. Amen. Deus, qui beatum Ambrosium episcopum catholicæ fidei doctorem at apostolicæ fortitudinis exemplum effecisiti, excita in Ecclesia tua viros secundum cor tuum, qui eam fortiter et sapienter gubernent. Per Dominum nostrum. Amen. "- - - Raise up in Thy church men after Thine own Heart who will govern her wisely and courageously - - -". What's the Latin for sooner rather than later? Along with being the 2d Sunday of Advent, this is the feast of St Nicholas. In rummaging around looking for a picture I ran across this site: "The Saint Nicholas Society: A website dedicated to the beloved saint from Myra, our modern day Father Christmas." There you are. Everything you'd ever want to know about devotion to St Nicholas, including a novena, a little office, a chaplet, pictures, a litany, and more.